If we continue with this administration Oak Bay resident public consultation, and access to information will remain a token gesture. This was evident on Monday, July 16, 2018, when 2 meetings were held, a Council Committee of the Whole followed by a regular Council Meeting. This was only a week after the July 10, 2018 Council Meeting where residents expressed thier concerns in writing and in person about the timing, short notice, and the far too many important community issues on the agenda. The agenda had 17 items including the eighty-two page 2017 Annual Report required by the Provincial Government, Terms of Reference for Legalizing Secondary Suites and the long-awaited Report on Development Cost Charges and Community Amenity Charges. Council’s response to the complaints voiced on July 10th, 2018 was to hold 2 back-to-back meetings the following week, with a total of 38 agenda items. And the irony is that the first item on the Committee of the Whole Agenda was the most recent version of several Public Engagement Task Force Reports. The new Public Engagement Report contained 70 acceptable recommendations however, the Report seemed redundant as it clashed with Council’s actions in scheduling the three summertime, July meetings with packed agendas. It was pointed out by a resident at Monday’s Committee of the Whole Meeting there are already two such Mayor’s Task Force Public Engagement Reports submitted in the past two Council terms with many unfulfilled recommendations. This is why the new Public Engagement Report doesn't inspire confidence. Reports without actions serve little purpose other than to give an impression of a change. Many of the recommendations in this Report is readily available (see International Association of Public - Participation Canada Chart Appendix #1). 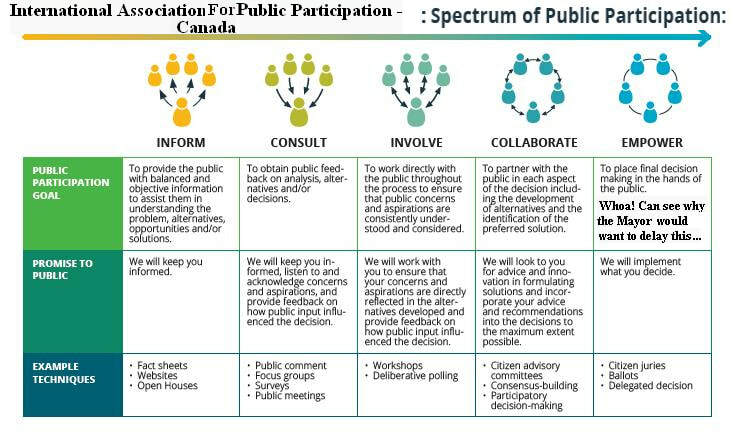 Many other communities throughout Canada have implemented Public Participation policy – It seems then Oak Bay could have just copied and implemented a Public Engagement format some time ago, free of charge? The $10,000 for the current Public Engagement process could then have been used to upgrade a few sewer lines or hazardous sHomeidewalks. As indicated in the last Oak Bay Watch last newsletter, the District has and is moving backward regarding information transparency and any meaningful public participation. There are fewer consultation opportunities than ever and the so-called consultations there has been were promotional sales jobs. Two other major reports, the Asset Management Plan and the Urban Forest Report has seen little-promised action without funding to meet the objectives. Infrastructure was under-funded in the last three budgets giving way to the majority of Council’s own priorities. Oak Bay’s Tree Bylaws are yet to be amended to increase protection for trees in our community. Another Item on the same 2018 Council Meeting agenda that failed to make the grade on Transparency/ Public Engagement was the proposed 4-lot strata subdivision adjacent to the world famous Harling Point Lookout and Trafalgar Park. Just prior to this July 16, Committee of the Whole meeting this development proposal was given final approval and yet the Community has been all but shut out of providing input. The District deemed the public interest was not a factor in the approval process. It’s worth mentioning that it was a member of the public that made Council aware that they were responsible for determining the financial contribution to reserve funds in lieu of parkland. This resulted in a developer contribution of $181,000 to the reserve fund or this would have been lost revenue. Additionally, these types of developments override our zoning bylaws without any opportunity for public input. Oak Bay still has no Bylaws for Development Cost Charges or Community Amenity Charges, although a Report presented on July 10.2018 showed what other municipalities charge and the significant amounts Oak Bay has been neglecting to collect. Is in the most sensitive environmental area in BC. There is significant blasting involved. Therefore residents asked Council if this development is not in the public interest then what development would be? They received no answer. There were so many inconsistencies and lack of policy in the process on this application that we will be reporting on it in a future article. Three Mayor’s Public Engagement Task Forces and Reports since 2012 have resulted in very little improvement. In some instances, the Community is worse off. For example, Council excluding council discussion from minutes and, technical problems with Council web-casts leave a gap and inaccurate records of Council meetings. Freedom of information request replies from the District have also proven to be problematic. It should not be too much to ask for adequate notice on Council agenda items that have serious Community impacts. The City of Victoria provides one week's notice on their agenda and hold many open house meeting where residents can question their Council and Staff on various issues. Oak Bay Watch and residents are not alone in not accepting this year’s Annual Report, Councilors Murdoch, Braithwaite and Zhelka voted against – this is the first time this has occurred in Oak Bay’s History. It should not be too much to ask that agendas be planned so important issues are not scheduled in July. Other members of the CRD present their Annual Reports prior to June 30th in compliance with legislation. There are obvious reasons for this timeline e.g. this is the only time many families can schedule their vacations. Although many of these issues are an easy fix it looks like nothing will change quickly. Council voted to accept the 2018 Public Engagement Task Force report, but not implement the recommendations until after the new Council is elected in October. So why was there a rush to present the Report in July when everyone, including the Mayor and 2 Councilors, is on vacation. Reports are of no use if their recommendations are not implemented.